The fall college semester is right around the corner. Many anxious, excited families will soon load vehicles with necessities and mementos from home as eager young people meet roommates, explore bustling campuses, and establish new daily rhythms and routines. Of course, each individual’s experience is unique, but many people who have had the opportunity to attend a college or university as a young person remembers a few of the highlights. Kenya Shakir also had one of those familiar “first time away from home” experiences when she moved from Fayetteville to Greenville to begin her freshman-year at East Carolina University (ECU) in 2012. “I had already packed my room up, basically, by June,” Shakir said. When “move in day” finally arrived, she remembers walking her family to the car at the end of a long day of shopping and settling into her new life. She said her goodbyes, consoled her crying little sister, and received a big hug and a few words of advice from her dad. “I was ready for them to leave,” Shakir laughed. “I was ready to be an independent, eighteenyear-old.” She quickly found herself both seeking out and embracing each opportunity that opened up for her as a college student. One of her first missions was to go onto ECU’s website and make a list of all of the clubs she wanted to check out as soon as possible. It didn’t take long for Shakir to establish herself as a campus leader at ECU. In addition to working several jobs throughout her years in college, she sought out opportunities to make a difference. She became a Resident Advisor at the start of her sophomore year; was an inaugural member of ECU’s Women’s Roundtable Book Club (Sister Talk), joined LeaderShape and participated in an alternative spring break in Atlanta, and served as the Diversity and Inclusion Coordinator for ECU’s Student Government Association. In addition to her leadership experiences, being a Sociology major with a minor in Leadership Studies also opened her eyes to social justice issues. Since graduating from ECU last year, Shakir has served nearly 1,500 hours as an AmeriCorps VISTA member planning and facilitating 25 programs as the Raleigh College Center Coordinator. 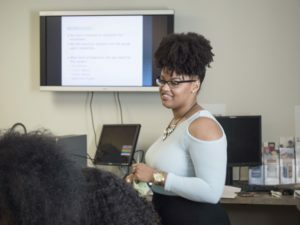 The Raleigh College Center is a community-based strategy of the Raleigh Colleges and Community Collaborative, which is currently transitioning to become the Wake Partnership for Postsecondary Success (WPPS). Through a collective effort called the Wake Promise (formerly the Raleigh Promise), the WPPS works with core partners including Meredith College, North Carolina State University, Shaw University, Wake Technical Community College, Wake County Public Schools, Wade Edwards Learning Laboratory, and Wake County Human Services to provide educational opportunities and employment resources to youth and young adults in the community. The purpose of the College Center is to increase college access and awareness for under-resourced students in Wake County. 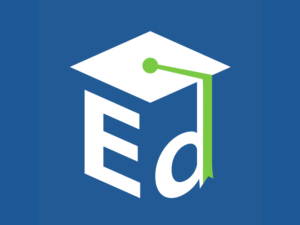 Throughout the year, Shakir has come into contact with approximately 225 young people and their families, and provided many with information about higher education. Understanding the transformative power of higher education, Shakir used her knowledge and leadership ability to help young people as they researched colleges and universities, crafted personal statements for their college applications, completed FAFSA applications, and made important decisions about their future goals. 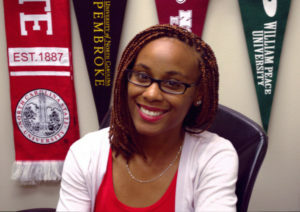 Though Shakir has nearly reached the end of her service hours as the Raleigh College Center Coordinator, she plans to take her knowledge regarding college access with her as she pursues a Master’s degree in College Student Affairs Leadership at Grand Valley State University in Michigan. The young, energetic leader is motivated to continue inspiring others to regard themselves as leaders. For now, Shakir is getting ready to begin yet another exciting chapter in her life—with a new story of moving away from home, making her mark as a leader, and helping and inspiring others. Though, she thinks a return to North Carolina might also be in her future.